Nabbing a bunch of snakes to wear on your head might not be the wisest of ideas. We here at the HalloweenCostumes.com offices understand that the materials to make an authentic costume or accessory aren't always readily accessible. Right? I mean, if you have a dozen red-eyed snakes, a bunch of glue, and a cap to stick them onto, you can probably make this happen... But we won't hold our breath. As a matter of fact, you shouldn't even if you do. No worries, though! 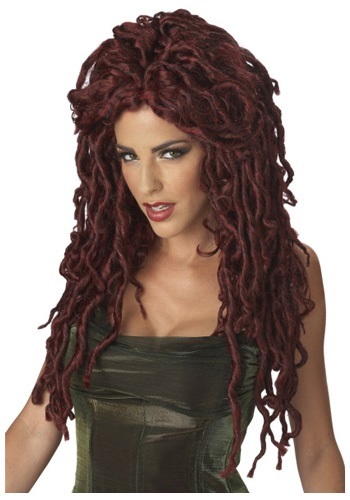 We've got you covered with this Medusa Wig. The best part is you won't have to worry about them biting! The second best thing? These synthetic red-and-black fibers, twisted into dreadlocks, are much more comfortable and much less slimy than the real thing. The third best thing? Everything else about it, of course. I was hoping that it would have more dreadlocks(like picture shows), but overall pleased with product. Received in a timely manner and package was sealed nicely.